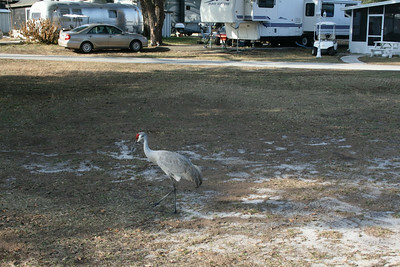 Kissimmee South RV Resort in Davenport, Florida near Orlando. This was taken in January of 2010. Sunday, January 23, 2011 - Davenport, FL -- After another marathon long haul trip, leaving New Orleans yesterday morning, we arrived in Davenport this afternoon. Our reservation had been made and we were told the office would be closed but they would leave instructions in the window. Those instructions weren't there, but we called the Tim, the maintenance guy, who got things straightened out. He guided us to our spot and now we're all set up. We expect to remain here for a minimum of two months. During this time, I will be making arrangements to change my residency to the state of Florida. There are a few reasons for this, but primarily it's for state income tax purposes, because Florida does not levy a state income tax. This process will include getting a drivers license and registering the vehicles (motorhome and Jeep) to Florida.